Tell Me A Story, Mr. Chetter! My school residency this past week pushed me to try some new and different things in my storytelling. When I was first approached to do this residency, I was apprehensive because of the age group (3 – 5) and not having age appropriate material. And admittedly, I was not completely comfortable with all the material I tried. However, it is part of the growing process and willingness to do new things and experience growth at all stages of my profession. I focused on Anansi the Spider Tales and Brer Rabbit Stories for my week with the (3 – 5) year olds. What I discovered is that with just a little tweaking and creativity, the stories I usually tell for older audiences were appropriate for this young age. For example, one of the crafts I had the children create was a drum made from a coffee can. However, it was not simply just a prop, when I told the story of why spiders hang in corners; they actually played the drum along with me as I played mine. 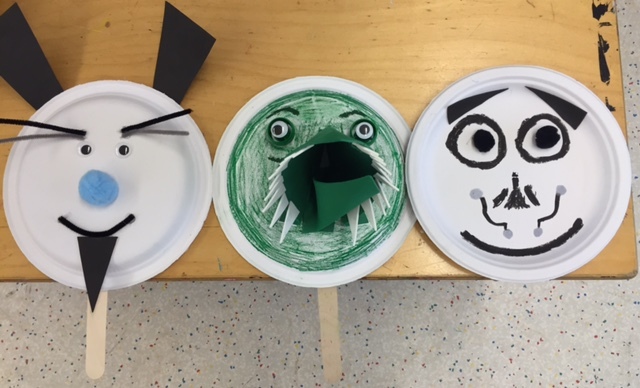 In another craft, we incorporated the masks made of animals into a story wherein the children role played the different animals. Additionally, in one of the stories, by incorporating a repetitive song and rhythm into the tale, the listeners knew where their part was and were eager participants as they came in on queue. One story that really resonated with the group and they really enjoyed was The Great Big Plop, which is a version of The Sky is Falling. In this story, I use different animals such as Brer Rabbit, Deer, Monkey, Frog, Elephant, & Turtle in the story. The students were so enamored with the tale, that they went outside and started reenacting it from beginning to end one character at a time. By the end of the residency, many of the students were telling their own versions of the stories of Brer Rabbit and Anansi or the parts they best remembered. So in conclusion, by learning new material and applying different techniques, this residency proved to be a rewarding experience for my personal growth as an artist and one which I can build upon.